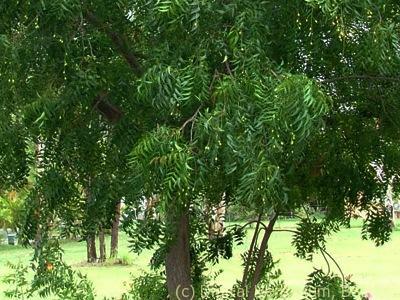 Scientific Name: Azadirachta indica L.
Habit:A medium-sized to large evergreen to semi-deciduous tree, up to 30 m tall, bark smooth, fissured and flaking in old woods, pinkish-brown or grey, inner bark orange-red, with sticky foetid sap. 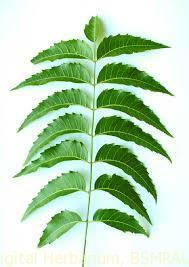 Leaves:Leaves alternate, imparipinnate, 15-35 csubglabrous, leaflets alternate below and opposite to subopposite above, 5-9 x 1.5-3.5 cm, falcate-lanceolate, subglabrous, apex long acuminate, base weakly swollen, very asymmetric, acute, margin serrate, lateral nerves 12-16 on each side of the midvein, obtuse, spreading, petiolules 1-2 mm long.m long, 4-7 jugate, reddish when young, petioles 3-7 cm long. Inflorescence:Inflorescence axillary, many-flowered panicles, or in axils of fallen leaves, fragrant, up to 30 cm long, subglabrous, branches up to 16 cm long, squarrose, bearing branchlets to 2 or 3 more orders, tipped with cymules of 1-3 flowers, finely sericeous, bracts and bracteoles 0.5-1.0 mm long, lanceolate, more or less pubescent, pedicels c 1.5 mm long, swollen at articulation with pseudopedicel, finely pubescent. Calyx 1 mm long, salveriform, the lobes imbricate, rounded, pubescent, with ciliate margin. Petals linear, spathulate, 4-6 mm long, white, imbricate, pubescent on both surfaces. Androecium: Stamens 8-10, filaments united to form a cylindrical staminal tube with 10 apical appendages, anthers c 0.6 mm long, basifixed, exserted, disk annular, fused to the base of the ovary. Gynoecium:Ovary 3-celled, ovules usually 2 in each cell, glabrous to pubescent, style 1, stigmas capitate. Fruits:Fruit a drupe, 1-2 cm long, ellipsoid, green, turning yellow when ripe. Seeds:Seeds ovoid, with a thin membranous testa. 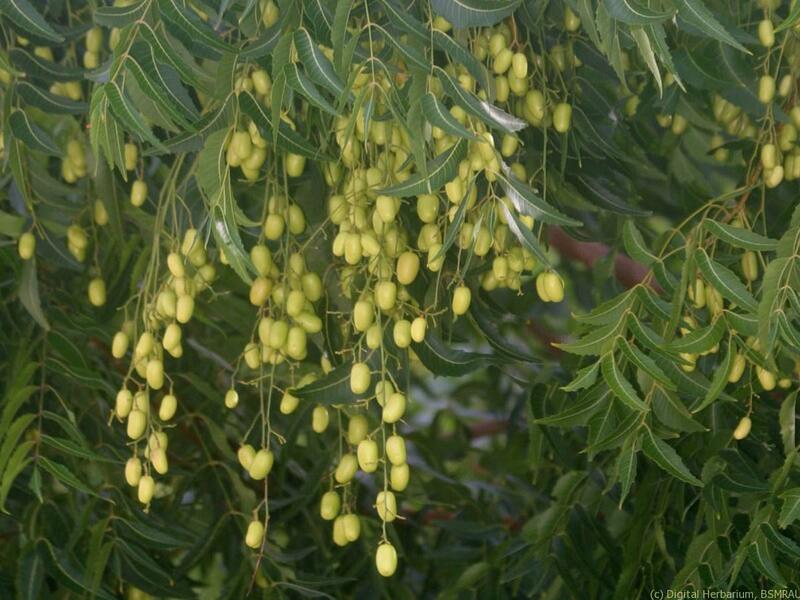 [Others]: The seed oil and its byproducts are used in a wide variety of products, such as soap, paper glue, pesticides, livestock feed and fertiliser. (b)The bark is bitter, tonic and antiperiodic, useful in intermittent fever. It produces a valuable gum and tannin. 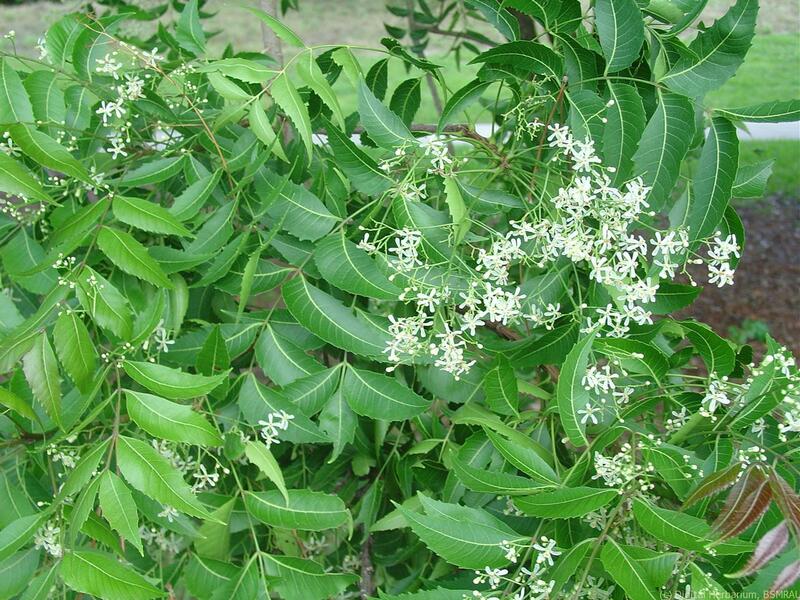 The leaves, bark and seed oil are used in the treatment of malaria, eczema, dysentery and ulcers, but is particularly effective as a parasiticide for skin diseases such as scabies.